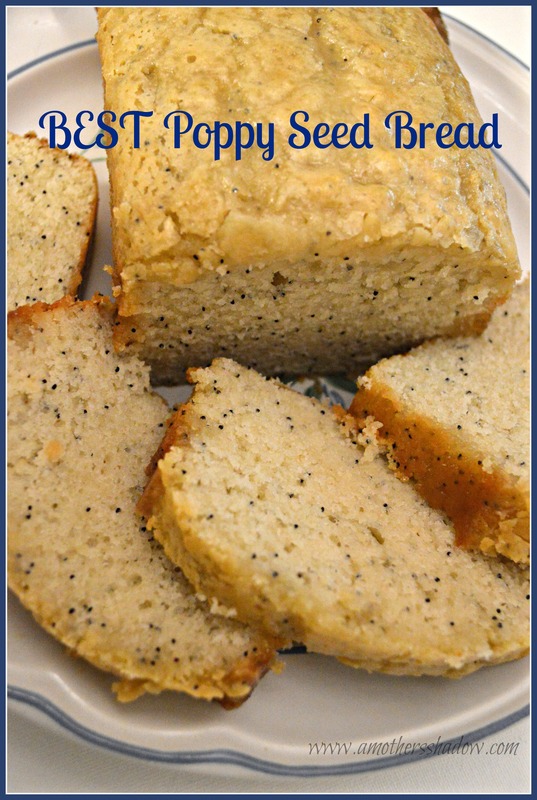 There are ssooo many recipes for Poppy Seed bread, but THIS is really the BEST Poppy Seed bread! It’s time-tested and proven to be AMAZING! The glaze on top is perfect and soaks into the bread just enough for an added bit of tenderness. Lemon, orange and other ingredients combine to make this Poppy Seed Bread the one I have stayed with and baked for years and years…which is the sign of a good quick bread, because I will try something new if I even think there could be room for improvement. Since it doesn’t have to rise, it’s simply mix, pour in the pan and bake. A great dessert, brunch, perfect to serve at a baby or bridal shower, a welcome treat anytime, and take-along gift to say thanks or thinking of you. Make up a batch of this BEST Poppy Seed Bread today. Line the bottom of the 2 loaf pans with parchment; optional, but it makes it much easier to get the bread out of the pan; and also coat with spray release. Combine all bread ingredients and mix well for 2 minutes. Pour the mixture into prepared baking pans. Bake for 15-30 minutes or until a toothpick comes out clean as the cooking time will depend on the size of pan you used. Take the pan(s) out of oven, and allow to sit for 5 minutes. *While the bread is sitting, make the glaze. Pour on *glaze, evenly, spooning on to make sure it’s covering all areas of the pan(s) you are using. Heat the glaze ingredients in a saucepan just until barely warm and the sugar is dissolved. Let the bread soak in the glaze and cool 10 minutes. Cover with saran wrap and let sit 30-45 minutes. Take the bread out of pan(s) and wrap in plastic wrap or slice and put in an airtight container. This step keeps the bread very tender and moist. DELISH!